Screenshot of the deleted scene from "Just One Bite". SpongeBob SquarePants is an American animated television series that premiered on May 1st, 1999 on Nickelodeon. The series depicts the chronicles of its title character, a child-like sponge living in the fictional city of Bikini Bottom. The series was a massive success and continues to air new episodes to this day, and has generated over 8 billion dollars in revenue for Nickelodeon. However, there have been quite a few scenes or bits of content that have been deleted or edited from episodes. 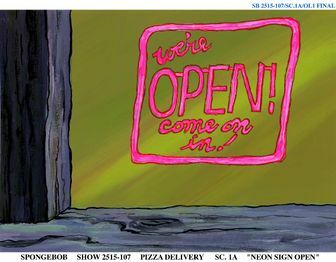 There were two background paintings created for the Krusty Krab's open and closed signs. There was also a shot with the Krusty Krab clock. An upshot of Squidward's house was made but never used in the episode. 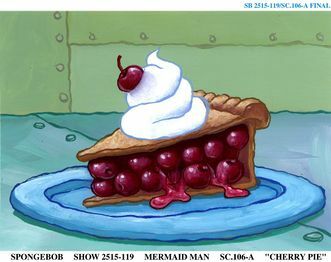 There was a background painting of a cherry pie made, but not used. According to the Season 1 DVD commentary, there was originally a scene in this episode that depicted Squidward naked but was cut for obvious reasons (even though Squidward is seen naked in other episodes). According to the season 1 DVD commentary, this episode originally had a scene that showed Sandy karate chopping a fish in the groin. This scene was cut for being deemed inappropriate. It is also noteworthy that this episode, along with the episode "SB-129" were removed from rotation sometime in the early 2000s for unknown reasons, though they have since returned. A cel using a background of Pearl's room was found on eBay, suggesting there was once a scene in Pearl's room. 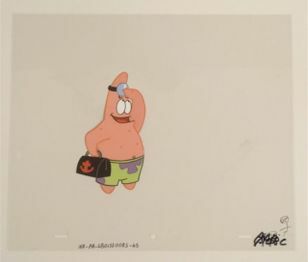 A cel of Dr. Patrick with a briefcase not seen in the final cut was found on eBay. There was also a painted closeup of one of SpongeBob's plugged holes but is not used in the episode. 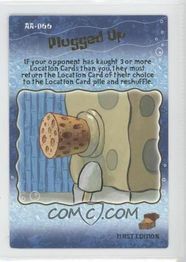 It can be seen on a set of trading cards from 2003. 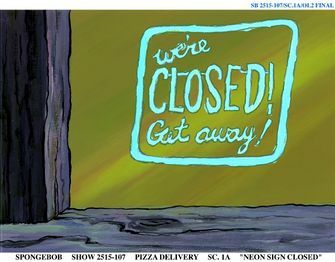 A cel with SpongeBob in a strange rectangular form appeared on eBay, not appearing in the episode. Right after SpongeBob says "Hey! Mr. Krabs is getting all sweaty again! ", There was a deleted scene which shows a vision of Mr. Krabs sitting atop of & sniffing a pile of treasure. Sherm Cohen, a writer/storyboard supervisor, posted a storyboard of the deleted scene on his DeviantArt account, proving that it indeed exists. 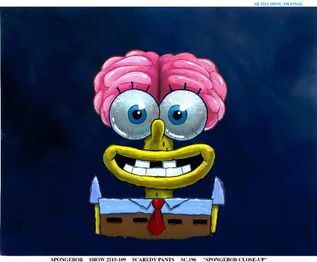 There was a closeup painting of SpongeBob with his brain exposed created, but it wasn't used in the episode. This episode was notorious for scaring children because of the scene that shows SpongeBob's seemingly painful and grotesque transformation into a snail. For years, there were rumors that in the original airing, there was an extra scene that depicted Squidward's transformation as well, but was cut in re-run's due to being too scary to children. A common piece of "evidence" for this supposed deleted scene is that there is an odd transition placed when Squidward gets hit with the needle, that immediately cuts to him being a snail. Some say that this is a remnant of the edit, though others disregard this as just poor transition placement. Some say that the episode still airs in its original version in Poland, but this was later proven to be false as well. Some claimed to have footage of the missing scene. The Polish airing of this episode was found on a website which hosts Polish dubs of children shows and movies, and it does not contain the scene in question. Also, clips of the supposed scenes were proven to likely be faked. Then on Jun 12, 2016, A YouTube user known as 90sGiveMeGoosebumps uploaded a video containing proof that this scene is fake. He insists that this is from the original airing and he also claims to have more SpongeBob Season One premieres on VHS tapes. 90sGiveMeGoosebumps has also dumped the whole premiere of Scaredy Pants /I Was A Teenage Gary onto multiple file sharing sites, permanently debunking the theory about the scene. In the scene SpongeBob doesn't want Sandy to leave before following her to the bus, there were several frames of anticipation cut. Several cels and sketches appeared on eBay. They were cut for unknown reasons. Twitter user LarryInc64 attempted to recreate the scene using the material found. Supposedly, the original airing of this episode ended with a dead fish whose shoes are being strung up. In future reruns, the scene was removed and replaced with a scene where only the dead fish's shoes are seen. 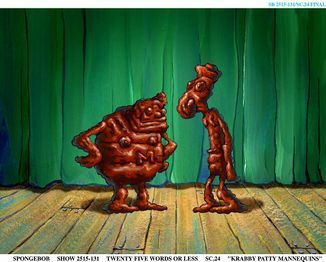 The Krabby Patty statues of Mermaid and Barnacle Boy at first used a more grotesque painting. 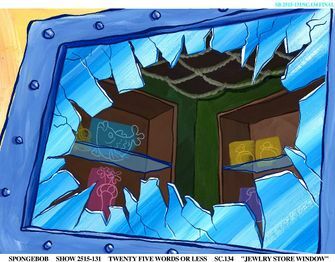 There were also three backgrounds of a scene where a jewelry store gets robbed, as well as the First Nautical Bank and a low shot of a building. 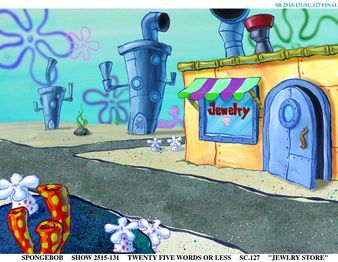 Interestingly, the jewelry store would later be used in the season 10 episode "Whirlybrains" as well as the video game SpongeBob SquarePants: Employee of the Month. 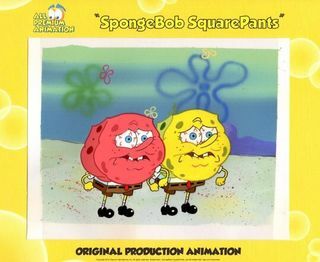 According to the Season 2 DVD commentary, after SpongeBob and Patrick hugged Squidward and ran away at the end of the episode, Squidward was supposed to say "Ugly and smelly, two for one", but this was cut due to the whole screen fading to black at the end, so the dialog wasn't needed. According to the Season 2 DVD commentary, during the scene when Sandy is raking leaves, she originally was meant to make the symbol for "Girl Power," but it was changed to "Texas." Sandy also originally did a whole dance routine when she was stepping on the leaves, but it was cut due to time constraints. 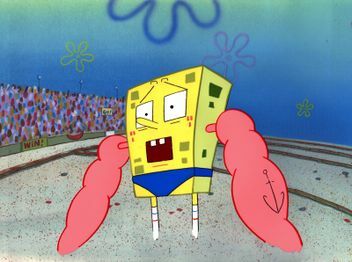 This episode also had an alternate ending that was replaced for unknown reasons; instead of SpongeBob laughing when he realized Sandy went into hibernation, he said: "Why I oughta!". 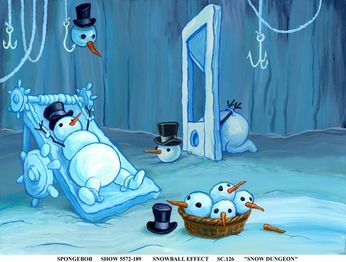 Supervising director Adam Paloian tweeted a background and storyboard panel of a deleted scene depicting a snowman torture room in Squidward's fortress. It was likely cut for being too graphic. Originally Squidward (as Santa) gave the first girl an antique instead of a wrench. Mr. Krabs originally said, "And don't forget about me Pony!" while waiting for Santa. After Santa (Squidward) gave the first girl her present, SpongeBob said: "I told ya he was real!". All of these scenes were removed for reasons that so far remains unknown. According to the Season 2 DVD commentary, there was originally a scene that showed Plankton taking out SpongeBob's brain before putting it in the robot. Patrick was originally supposed to say SpongeBob's drawing was "Lower middle class," but that line was changed to "Lacks basic construction," possibly for it being a very out of character thing for Patrick to say. 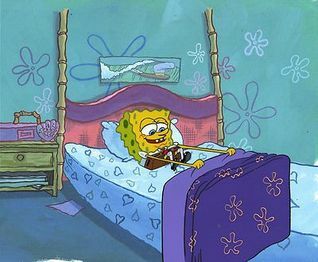 Many people online claim to have seen a picture of SpongeBob with a lampshade over his head or a picture of SpongeBob in his underwear when Patrick reveals the embarrassing photo of SpongeBob during the original airing and the first re-runs. Interestingly, the photo in the box was actually revealed in a SpongeBob book released sometime after the episode, and it seems to match the second description from above. However, Wiki user Sloucher112 claims to remember a photo matching the first description: "It showed SpongeBob passed-out drunk on a table wearing a Christmas sweater and a lampshade on his head surrounded by cartons of eggnog. You could also see Sandy and Squidward giggling in the background." 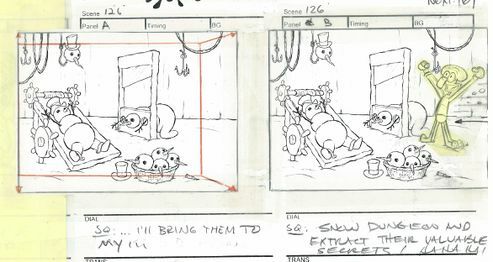 In the special features of the Sponge Buddies DVD, you can find a storyboard of the episode which features a deleted scene. In the scene, it shows SpongeBob deliver mail to "Floorboard Harry." Also, Floorboard Harry was originally the one flickering the lights, not Nosferatu. According to the Season 2 DVD commentary for this episode, there was originally a scene where SpongeBob says to Patrick "Go *dolphin noise* yourself" (Go f**k yourself) to which Patrick replies "*dolphin noise* you too!" (F**k you too!). It was cut for being inappropriate for children, despite the rest of the episode is full of dialogue similar to this. It was possible this was because it was upfront profanity instead of the random nonsensical use of the dolphin noise in the episode (as it might lead on to believe that it sounded too much like the F word). There are three deleted scenes in this episode. These scenes aired in the US until 2005 when they were cut from all other airings afterward. The first scene shows SpongeBob looking out the window and seeing all his friends outside. He sees Patrick rubbing sunscreen on Sandy. The next scene right after that is SpongeBob imagining a live-action car crash. The last scene was him doing calisthenics. These scenes are on the season 2 DVD, the Christmas DVD, and on YouTube, they are also still on Canadian television airings. It's still unknown why these scenes were removed in US airings. Some say they were cut for time reasons while others say they were due to their content. There was originally a scene that showed Sandy getting arrested for kicking SpongeBob's bottom. This scene was cut possibly to save time. Also noteworthy is that this episode, along with "Mid-Life Crustacean" are banned in Canada, possibly because of animal abuse in the first segment (SpongeBob's abuse to Gary) and how the second segment makes fun of old people. There was a cut scene near the end of this episode. During the scene, Squidward is attempting to break into the Krusty Krab, and he walks into the building he sets off their "security system" (a bucket of gasoline and a lit match) causing a massive explosion leaving him charred black, and doing it again when he walks into the kitchen. Some claim that the sequence was cut sometime during 2002 while others claim that it was cut after its first airing for unknown reasons. 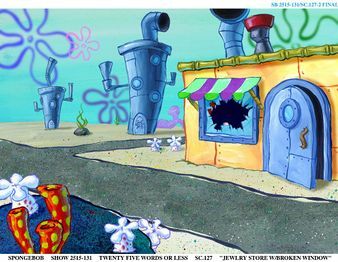 The version that is currently shown on TV and on home media releases replaced the scenes with a slide/zoom cut to Squidward in the kitchen without any burns. However, there is another edited version that retained the first but not the second gas explosion. It is commonly assumed that the cut was made because of 9/11. However, this is false as the episode aired a month after the attacks yet the sequence was still included. Vincent Waller later confirmed the scene was changed because Nickelodeon doesn't tolerate stunts involving igniting gas. This scene is still intact in Canadian airings of this episode and on the VideoNow version. The scene can easily be found on YouTube. Deleted scene from "Just One Bite". For years, there were rumors that in the original airing of this episode, there was a part with Patrick saying "I wish my nuts were chocolate" followed by him pulling out peanuts in a bag, possibly planter's peanuts. This was believed to have been cut for being inappropriate. As of July 2018, Vincent Waller confirmed that this scene was not real, and was not even drawn in the original storyboard. There was a scene rumored to be in the original airing that showed some blood on Master Udon's face after Sandy beat him up that was allegedly removed for being too violent. This scene was later confirmed to be nonexistent by Vincent Waller. The dedication card to Pat Morita (who voiced Master Udon in the episode) at the end was also removed after the Best Day Ever marathon. ↑ A storyboard of the deleted scene on his DeviantArt account. ↑ The MEGA link to the premiere of Scaredy Pants /I Was A Teenage Gary. ↑ The Mediafire link to the premiere of Scaredy Pants /I Was A Teenage Gary. ↑ Vincent Waller's Twitter post on the Hooky scene. ↑ Adam Paloian's Twitter post showcasing the background. ↑ A DeviantArt post to the SpongeBob picture. ↑ A storyboard of some deleted scenes in the Graveyard Shift. ↑ Vincent Waller's tweet debunking the scene's existence. ↑ Vincent Waller's tweet about the Karate Island scene.